The ar-15 has remained relatively unchanged since 1963. Maybe we need to be looking elsewhere to resolve this. To be fair, the FBI did look into his alarming YouTube posts, but they couldn't identify him as the user. Also, even if they did know it was him, I don't think they had any legal grounds to take his gun(s) away. However, they failed to do their jobs as law enforcement and 17 people died needlessly because of their failure. I don't ever trust law enforcement to be where I need them in an emergency at the right time, which is why I believe strongly in the 2nd amendment. What I'm saying is, even if they found his posts alarming and disturbing, what could they have done from a legal standpoint if he didn't actually make a specific threat? The point is, in ANY situation, police, law enforcement, ect. Is really just a clean up crew. They cannot intervene until a crime has, or is being committed. By then it's too late. If I as a private citizen, believe I'm going to need protection (from an abusive ex or a threatening neighbor) I should have the right to have tools to defend myself. I know from experience that police take forever to show up, even when a gun is involved or discharged. Courts have even ruled that police witnessing a crime (i.e. a stabbing) do not have to intervene until it is safe (for them, screw the victim) to do so. They do have watch lists, and we have the capacity to pinpoint terrorists around the world. A 19 year old in FL should not be much of an issue. There should have at least been a flag created that triggered an investigation when the second call came in, with more specific information. They could have tracked his computer's activity and overall his activity. He has mental healh issues, so I'm suprized he wasn't monitored more. This may come as a total shock to you and the rest of the right/left automatons, but rumor has it that the SECOND Amendment ain't the only one, hence why the SECOND Amendment is called the SECOND Amendment. There's a First Amendment. A Third Amendment even, etc. In terms of what you propose, DO NOT, repeat, DO NOT look up the FOURTH Amendement. Because laws mean things. Probable cause? As required by the - come on, you can say it - the F-F-Fourth Amendment. So the parents knew that their son was uploading disturbing videos to YouTube and had a violent mental disorder and still didn't give a warrant? Nevermind, it happened because of bad parenting. "You're confusing me. I should've taken Jame's advice and never talked to you." Ohhhhhh, wait, not the James who uses "red herrings" and "strawman" with a "boo hoo, you ad hominemed me" and nothing but as 'arguments' just like you do? Thought ya sounded familiar. You should be thankful. You tried trolling me earlier, and I told you I was gonna show you how triggered I am. You gave up on that thread. I can resume that course on every single comment you post from now on if you wish. Guns ain't the only arms, ya know. 2nd Amendment, what a concept! "Ok fine. Millions of warning signs were issued, allowing a warrant, but no warrant was granted. You happy now? My point still stands: the FBI screwed up when they were needed to not screw up"
HAPPY? PEOPLE ARE DEAD. Oh, that's right, we're talking #gunrightsmatter. Not to excuse the FBI, but fact is they do get MILLIONS of calls about such - coast to coast. The vast majority have nothing to them. Many are outright lies. You're telling me that you have never heard anyone - including yourself - swear they were gonna killl that somanabiitch for so much as not flushing the toilet? You're confusing me. I should've taken Jame's advice and never talked to you. And you have no issue with YouTube allowing such material? Warrants aren't issued for viewing. There's a First Amendment too you might NOT want to check out. He WAS reported to the FBI, etc, by others concerned about threats he made. THOSE warranted investigation. THOSE were ignored. You cannot lock someone away simply for hearing voices in their heads. Ok fine. Millions of warning signs were issued, allowing a warrant, but no warrant was granted. You happy now? My point still stands: the FBI screwed up when they were needed to not screw up. It amazes me that the teeth gnashing myopic two sides are only debating gun rights, when the issue is HUMAN rights, as addressed by the Consitution and ALL the Amendments, including the 4th. 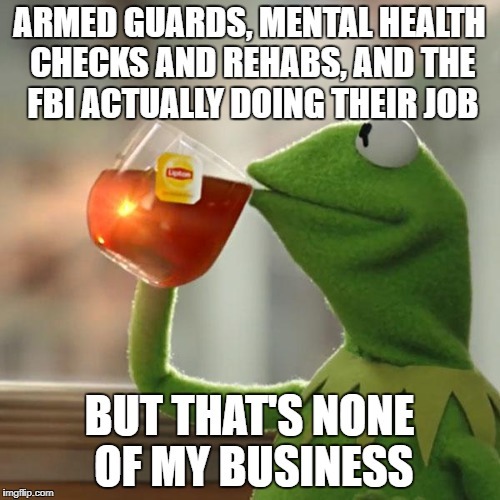 That the solution is to lock away any and all with mental disease to protect the precious reputation of firearms invented soley to kill is beyond ludicrous AND a violation of the Fourth Amendment. That's why I asked what LE could have legally done. Obviously if they violated the 4th Amendment during their investigation, that would have been wrong. No one ever said to lock away anyone and everyone with mental illness. Only the alt right, and many on the left agree. Arming teachers seems to be the right way to go about this, after all Reagan who was surrounded by armed secret service agents would never have been shot if he was guarded by armed history teachers. When will Americans wake up and realise we need more guns to combat mass gun shootings. The better question is why not tweak the ones already on the books and enforce those. Because most laws don't have nasty side effects. I have no idea what your point is, I have never argued against gun registration, and could easily be persuaded to make them somewhat tighter. Maybe banning them would make you and a handful of others feel more secure, but the fact is plenty of mass murderers have been able to make do without. Some leftists want all guns. To be fair, those were semi-auto. 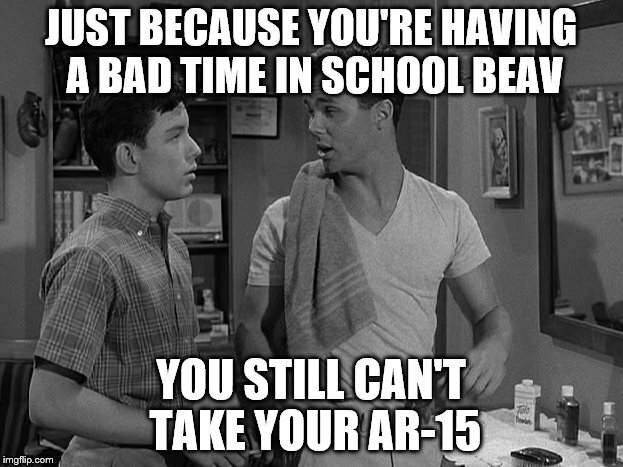 I thought about including that image in the response but passed it up for that reason, even though they aren't an AR-15. Really, and what is the data source? Please provide verifiable data, not some talking point.